Zurich: home to Albert Einstein when he first started thinking about light passing through warped spacetime, and so what better place to have our first workshop! 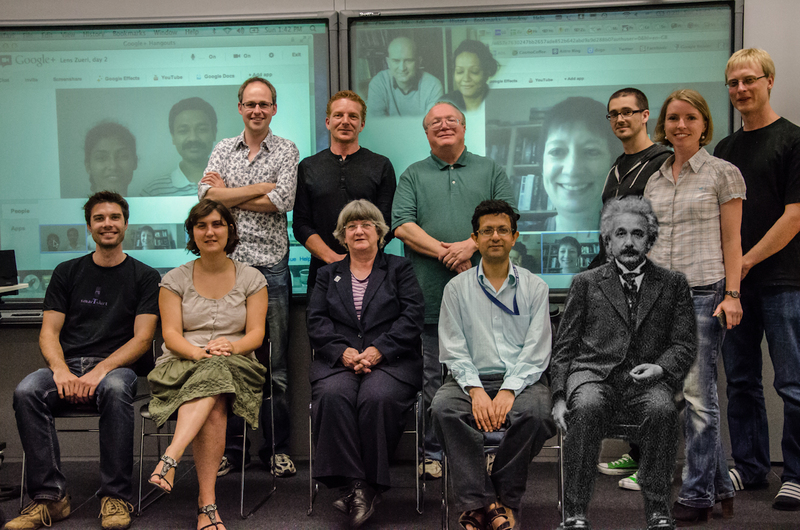 The Lens Zoo team and a few Galaxy Zoo forum moderators and Lens Hunters met up at the Institute of Theoretical Physics at the University of Zurich at the weekend, both in person, and remotely via a Google+ video Hangout. Even the team from Chicago who got up at 3am to be projected four feet high onto a screen managed to stay cheerful the whole time! We spent a couple of days thinking through the problems that we’ll face when trying to find thousands of gravitational lenses over the next few years. So, what did we talk about all weekend? Among other things: how we should display images, and how we can best enable their investigation, how to teach new users about gravitational lensing, which features of the various Zooniverse projects we could make use of, and what tools we have to help advanced Lens Hunters to go the extra mile. For now, you can see the slides that the science team made for some of the sessions in the links below. We’ve got a bunch of problems to solve, but also some good ideas to get started with. The team will be writing their own postcards from Zurich on here soon, and we look forward to hearing your comments as we go. We need and value your input!